Having restarted the analysis of the temperature data, the second state along the road is Kansas. In the original post on the topic I had used the homogenized data, and had ignored (through ignorance of location) one of the GISS sites. So we will redo the data and see if there are any changes in the conclusions. In case you are new to this I am comparing the GISS station average data for the different states with the averages from the USHCN sites for each state. Having looked at the three different sets of data available (Raw, corrected for time of observation (TOBS) and homogenized) in this set I am going to use the TOBS set. And that means that first I have to get them, which I do from selecting the Map Sites for Kansas at the USHCN web page, and then clicking on the “Get Monthly Data” icon, selecting the “create a download file of data summarized by year”; and then selecting the “Annual Average Mean Temperature – TOBS,” and hitting the submit button. This is for Anthony, KS so after downloading the file, which is comma separated (csv), I label it and save it to the desk top. The files for all 31 stations is handled in the same way, and then each is copied and pasted over the data in the master file that I made for the original homogenized data. (The file is then saved with a TOBS label). Now there was another error that I made in the original file. I thought that only Wichita, Topeka and Concordia were in Kansas, from Chiefio’s list, however there are also Dodge City and Goodland that I did not include. So I need to go to the GISS site and download (and convert) those temperatures. 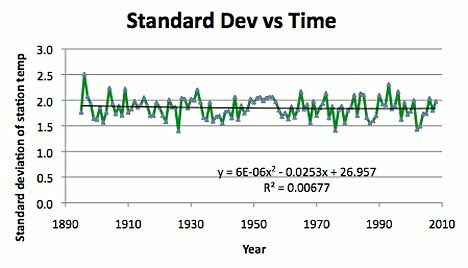 It is mildly irritating to find that the Goodland data only goes back to 1948, so that when one just runs an average comparison of the two sets of data, the shorter series has a quite significant impact. However, with this data series, in contrast to the homogenized data set, there are significant gaps, particularly in the early years in the individual station data. 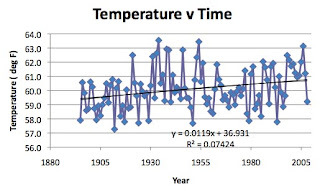 If one goes back and compares the homogenized data plot both lines, although taken to the second power are relatively close to straight, and both show a change in response from positive difference to negative difference around 1950 (which is odd given that the initial plot had three full GISS station data to work with). Interestingly, with the TOBS correction only in the data, there is realistically no trend with the standard deviations on the data, while there was a declining trend in the earlier plot that is not evident from the TOBS data. One thing that I have just noticed, however, in comparing the two sets of data, is that the scale of the vertical axis has changed. 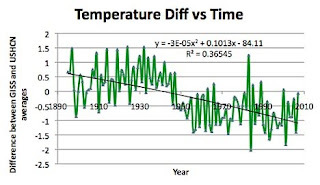 The above is the data for the average temp with the only correction being the time of day of observation. This is the plot from the homogenized data set, that I put up last February. 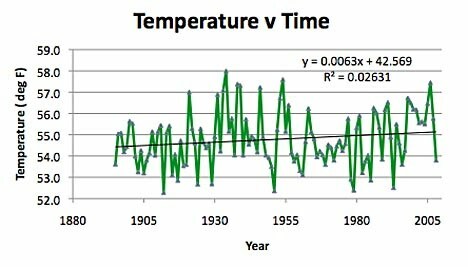 The shapes are close to the same, and the highest temperatures were during the dust bowl years, but the values themselves have changed – how odd. 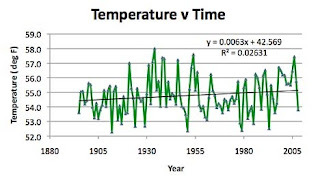 So a quick check back on that data, and there was an error - I had not correctly averaged the initial data set, and when I corrected that the two curves are much closer, with the homogenized set now falling very close to the TOBS in overall average values (homogenized value 54.8 deg, for the TOBS data 54.78 deg) but the rate of temperature increase is now less. The zero population value was 52.1 deg and the correlation coefficient was at 0.08, which given that the homogenized data is supposed to compensate for population levels is a bit odd, but never mind, we really are still in the early game without huge numbers for the larger cities. You note, from the r-squared value, that it is likely that the change in elevation is the stronger driver toward temperature drop. 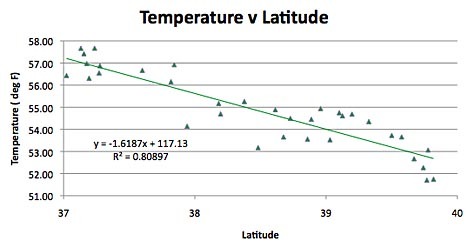 Interestingly with using the TOBS data the correlation with latitude has improved, as has that with elevation, which is much better than that with the homogenized data, though the longitudinal correlation is slightly worse. So more questions, some trends remain, we will just have to see how this pans out as we move into gold-mining country.